Ask fellow campers about "Famil-E-Fun Campground and RV Park" and nearby attractions. Our preferred stay when traveling through the area. Easy access, friendly owner, huge shade trees, lots of grass....just about perfect. Ask for satellite friendly sites due to the trees. The WiFi worked well since there were few people in the park during our stay. Verizon cell/data was strong, no cable and only a few OTA channels. Peaceful, pleasant stay - wish more parks were like this. We camped at Famil-E-Fun Campground and RV Park in a Motorhome. Very easy access off I-90. Friendly helpful hosts. Nothing fancy but peaceful, quiet, lovely. Gravel site and roads, level. We stayed 2 nights, one en route and one returning. To get satellite reception you must be in back row, more open, 2nd nite ours did not work under the trees, but it did not matter for 1 overnight. 50 amp hookup, sewer, water. Although I did not use them, I walked to see restrooms and showers which are older style but immaculate. We would definitely stay again, easy pull thru for our 42ft with toad, a pickup truck. They also have a quaint small store. We camped at Famil-E-Fun Campground and RV Park in a Motorhome. RV Park directions from Google Maps took me right to the RV Park. The park was easy to get into and out of. Cost of one-night stay with discount was $32 plus $2 tax. Owner was very friendly. Took us to our on his golf cart. Site was large with plenty of room on each side. Had a lot of large beautiful shade trees. Told the owner we wanted satellite and he parked us so that the trees would not interfere with our service. The park had very nice green grass. It was quite beautiful. We would stay here again and recommend this park to others. 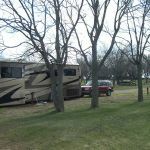 We camped at Famil-E-Fun Campground and RV Park in a Motorhome. Went to the Corn Palace here. It is worth going to see. A great campground for an overnight. Easy on/off of 90. Friendly owners and a clean campground. Nicely shaded sites I walked into the restrooms and showers. A bit on the dark, older side, but very clean. A bright laundry room. We camped at Famil-E-Fun Campground and RV Park in a Motorhome. 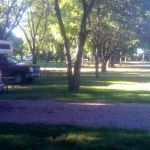 Wonderful little family-owned and operated campground just a few miles west of Mitchell, SD and very convenient and easy on/off of I-90. Worth staying a few miles out of the town proper, and the interstate noise was barely audible for 4 nights. The owners are very friendly, and leads each person to their site personally. Interior roads and sites are packed gravel, with level sites, lots of mature shade trees, easy maneuverability... and a fair number of entertaining wild rabbits frolicking in the evening. There is some evidence that roads and sites can be underwater a bit after really heavy prolonged rains. Clean and well-maintained grounds and bathroom/shower/laundry facility. Water pressure just a bit on the low side. Unfortunately, pool is out of commission this year. Only wifi is at the office/store, but it worked well. Verizon coverage is excellent. Gem of a park, would definitely stay here again. We camped at Famil-E-Fun Campground and RV Park in a Fifth Wheel. Not a whole lot to do in the area- the famous Mitchell Corn Palace is worth a short trip to see the changing outside corn-murals. Can bike ride around Lake Mitchell, which unfortunately is suffering from a blue-green algae problem and can be smelly at times and not safe for water recreation. This is a gem of a park on the plains. Lots of trees and grass. Nice level pads on hard packed dirt and gravel. Owner ensured I had a spot for satellite TV. Good electric, water and WiFi. About 15 minutes or so to Mitchell with Walmart, restaurants, etc. We camped overnight, but would come back again and stay longer to spend time in Mitchell. Park is big rig friendly and we had no issues maneuvering our 44 foot with toad in or out of our site. We camped at Famil-E-Fun Campground and RV Park in a Motorhome. Mitchell has grown up since our last visit many years ago. Lots of shopping and restaurants with a nice mix of hometown and chain stores and restaurants. very nice campground with a nice setting! Lots of green grass and trees to provide shade. Hookups and water pressure great. Had a pool, swingset and basketball hoops so kid friendly. Owners extremely nice! Very nice setting We camped at Famil-E-Fun Campground and RV Park in a Motorhome. Site was very nice. Owner made sure TV reception was good. He also trimmed branches away that were in the way of our slide. Good places to walk the dogs. Quiet camp. Good hook ups. 50 amp costs a little more. All in all a very nice two day stay. We camped at Famil-E-Fun Campground and RV Park in a Fifth Wheel. Just off I-90 easy in and out. Large shady sites long enough we didn't have to disconnect for our early departure to the Badlands. Nice park friendly staff they even lead you to your site. Beautiful clean pool just the thing and they sell ice as well as snacks in the office. Also pet friendly. Amazing wood carvings in front area. Certainly one of the best RV Parks we've stayed in as we traveled to Yellowstone. We camped at Famil-E-Fun Campground and RV Park in a Travel Trailer. If you are taking I-90 west make sure you stop at Wall Drug. Coffee is 5 cents and ice water is free !! The staff is very friendly and escorted us to our pull through site. Interior roads and sites are gravel and level. Since we did not have a satellite dish we were in a nicely shaded spot with grass between sites. Good water pressure and 50 amp power. We used the laundry room, which was clean but was not air conditioned, so it was very hot in there. Overall, a very nice park and we would stay there again. We camped at Famil-E-Fun Campground and RV Park in a Motorhome. The Corn Palace in Mitchell is very close and a fun thing to see. Most of the attraction is on the outside, so don't expect much when you go inside. Stopped by for an overnight. Didn't have reservations, but park was pretty empty so no issues getting a spot. Ownership is way nice, all sites have good amount of shade on them which is awesome in SD during the hot summers. Pool wasn't sparkling clean, I'm sure it's hard to keep clean with the dust and wind, but definitely clean enough to cool off in. No cable, doesn't bother me though. I would definitely stay here again. We camped at Famil-E-Fun Campground and RV Park in a Travel Trailer. Great Ma and Pa run campground located within 5 miles of the Corn Palace. Showers and restroom were clean and well supplies and maintained. All utilites worked fine, sites are gravel and fairly level...Encountered my first flat on the van and owner came out had helped take the tire off, spare, new, was rusted in place...He had another man ran me into town to have the tire repaired...$15 and we were on our way...The owner helped put the tire back, thanks again. We camped at Famil-E-Fun Campground and RV Park in a Travel Trailer. You must visit the Corn Palace and do take the little tour that they present there, well worth the time....A small piece of America. Right off the interstate with lots and lots of big, mature trees throughout the park that create a very quiet, relaxing atmosphere. Pool is open, a little chilly, but open! A small put put, lots of room for the kids to burn off all that energy from traveling. Sights are dirt but very level and very shaded. This is a definite "do over" again spot! We camped at Famil-E-Fun Campground and RV Park in a Fifth Wheel. This is a nice family-owned campground just off I-90; a nice overnight stop. It was mostly empty on a Monday night it fills up on weekends. WiFi is good but no cable and only two OTA channels. Our pull thru site was large and plenty of room to put out our slides and awnings. The small store has postcards, a few supplies, and Schwan's ice cream bars. We don't tow, so could not take a trip into nearby Mitchell. We camped at Famil-E-Fun Campground and RV Park in a Motorhome. The park has a large, beautiful pool. We had reservations here, but had to cancel at the last minute due to changing plans. When we called to cancel, we were prepared to have to pay for the night anyway. But we were pleasantly surprised when we were told he didn't charge people for changing plans. We were very appreciative! If we're ever in the area, we'll be sure to stay at Famil-e-Fun! We camped at Famil-E-Fun Campground and RV Park in a Travel Trailer. Close to the Corn Palace. About 5 miles to the Corn Palace, but it's quiet and rural here. Quick trip down 90 will also get you to Walmart. Not 100% sure of our site number. The Corn Palace is the main attraction in the town of Mitchell, which is 5 miles east of the campground. However, we opted to visit the prehistoric Indian village just immediately north of Mitchell. We found it to be very interesting and worth the stop. Corn Palace and Cabelas are very close by. Are you affiliated with Famil-E-Fun Campground and RV Park ?